Sound "The first thing that really stood out was a wonderfully low noise floor"; "bass is slightly fattened, but deep and with good impact," while "midrange timbre is excellent," vocals sounding "rich and full." Features Integrated analog setup with turntable, tonearm and moving-magnet cartridge; built-in level and record clamp included. Use "Basically a plug-and-play unit" with pre-mounted tonearm and cartridge. Value "Add everything up, and it is easy to see that the value far outweighs the cost." Have you heard this one? A man walks into a hi-fi shop. He says, "I wanna buy a turntable. It has to be of split-plinth design, have a tonearm that can be adjusted, include a really good cartridge, a glass platter, its own level and a threaded record clamp -- and Im not gonna pay more than $500." Until now, this was a joke. Maybe, and I do mean only maybe, he could have started looking around over in the trade in section. Happily I am able to say that the ultimate punch line has arrived: "Oh, you want the Music Hall MMF-5." Measuring 18 1/4" x 13" x 5 3/8" and weighing in at 24 pounds, the MMF-5 seems at first glance to be pretty standard fare. It is only after you start looking closely at what is offered that the real wonder begins, especially in light of the asking price. The base is a two-part design, with the dust cover, tonearm, and bearings mounted to the upper half while the twin-pulley motor (33 and 45 rpm), hidden power switch, four spring feet and cords are all attached to the lower half. Six small hemispheric viscoelastic feet isolate the two platforms from one another. The use of a dual plinth is highly desirable in that it significantly hinders mechanical-feedback artifacts, including those that may be generated by the motor, from reaching the sensitive platter/'arm/cartridge system. Music Hall even had the foresight to install a bubble level right into the top plinth. The platter is fashioned from glass and topped with a black felt mat. Much denser and thereby less prone to excitement than the molded plastic found on the MMF-2 (and other similarly priced tables), the MMF-5 is also very classy looking, reminiscent of the Rega Planar 2. The spindle is threaded for the acceptance of a matching record clamp. Can you say thank you? The tonearm is the same as that found on the Pro-ject 1.2, and for good reason. Both 'tables are made in the same factory in the Czech republic. The 'arm, which can be begrudgingly adjusted in two planes, has a decent set of gimbals, includes damped cueing, and uses a thread-and-counterweight anti-skate system. Hanging proudly from the end of this simple yet effective tonearm is a natural-sounding little cartridge from Goldring, the 1012GX. Now lets take a closer look at what we are getting. The Goldring 1012GX medium-mass moving-magnet cartridge sports a fine-line-type stylus, is of relatively high output (6.5mV), and sells for $175 USD alone. Record clamps are essential to getting the most out of your records and they range in price from about $30 (for a slightly effective rubber friction fit type) to over $300 for some of more elegant design. 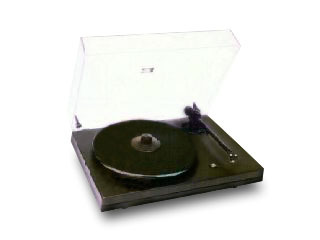 Turntables that include a threaded clamp start well above this price. Then there is the dense glass platter, providing a less resonant platform for the record, the well-isolated dual plinth, the bubble level, and the adjustable (with some effort), well-balanced Pro-ject tonearm. Add everything up, and it is easy to see that the value far outweighs the cost. Because the 'arm and cartridge are included and pre-mounted, the MMF-5 is basically a plug-and-play unit. You do have to set the tracking force and anti-skating, but you would have to check that with any turntable. The only disconcerting thing I noticed during initial set up was that the azimuth was off -- the tonearm was rotated slightly clockwise past vertical when viewed head on. Though visually slight, noticeable by eye translates into a significant error at the record. At first I was quite concerned about this as I thought I would have to find some way to loosen the 'arm at the gimbals to correct this inaccuracy. Luckily, it responded to a light twist and was easily maneuvered back to true. While I was concerned that this overt looseness might contribute to some loss of performance, I adopted a wait-and-hear attitude. Setting azimuth back to vertical, I checked for overhang and alignment with the aid of my DB Protractor. Both were as close to dead-on as I was capable of measuring with the affordable DB Systems tool. Having used a superb Wally-tractor fabricated specifically for my Magnepan 'arm, I found myself wishing Wally made such a 'tractor for this 'arm. After balancing the tonearm and calibrating the dial indicator to zero, I set the tracking weight to the recommended 1.7 grams using a Shure gauge. Be sure to use some type of gauge as the "calibrated" markings on the counterweight ring were way off on my unit, not an uncommon occurrence. Though I experimented with tracking from 1.25 to 1.9 grams, the recommended 1.7 grams seemed to offer both the best tonal balance and tracking ability from the 1012 GX, which uses the Gyger II fine-line-style diamond stylus. Anti-skating is a snap; just seat the loop in the correct groove on the provided arm protruding from the top rear of the back of the gimbals and hang it through the wire hold to the rear right of the 'arm pivot. Ready, set, lets go transcribing! Right out of the box, the MMF-5 sounds stiff and somewhat strident. There was an obvious nasality to the upper midrange. Bass, though fairly fast, was quite light and under developed. Most notably, the upper treble was fairly aggressive. After about 20 or so recordings, things started to get much better. I wanted to give the little guy at least 100 hours of run-in to make sure the cartridge suspension, gimbals and motor were nimble and fully acclimated. Amplifiers  Hafler P1500 Trans-Nova, Pass Labs Aleph 3. Analog  Linn Sondek LP12 turntable, Magnepan Unitrac 1 tonearm, van den Huled Denon DL-103 D cartridge, Harmonic Technology Silver Crystal phono cable. Digital  Pioneer PD-41 transport, Perpetual Technologies P-1A/ P-3A combination. Interconnects  Harmonic Technology Pro Silway MK II and Magic Link prototype. Speaker cables  Harmonic Technology Pro-9 Plus and Magic Speaker Cable prototype. Digital cable  Harmonic Technology Cyber Link Platinum. Loudspeakers  Von Schweikert VR-4 Generation II. Once comfy in its new surroundings, the MMF-5 started to sing its own very inviting song. The first thing that really stood out was a wonderfully low noise floor. This turntable/tonearm/cartridge combo is much quieter in operation than I recall the MMF-2 having been, and, in fact, much quieter than I recall any of the similarly priced competition Ive auditioned. Bass is slightly fattened, but deep and with good impact. Listen to "Some Other Time" or "Dont Let It Show" from the Mobile Fidelity UHQR I, Robot by Alan Parsons [MFQR 1-084]. Good, deep extension, nice slam, but with just a hint of blur, causing a thickening or slurring to the lowest two registers. I am forced to wonder if this may be in some way related to the looseness I noted when rotating the tonearm to correct the azimuth. Though horns, piano and massed strings can occasionally be rendered as just a bit too forward, for the most part, midrange timbre is excellent. Vocals are rich and full, with that hint of body that makes vinyl so irresistible. The aggressiveness shows up occasionally in the upper midrange, for example on "The Thrill Is Gone" from Patricia Barbers Café Blue [Premonition Records 737], where it manifests itself as a slight hardness to the piano. While the top two octaves are executed just a bit on the whitish side of natural, they are detailed and well focused. This is clearly demonstrated on "Wouldnt Want To Be Like You" from the previously mentioned I, Robot UHQR. One very welcomed attribute that became apparent after repeated comparisons of the same recording on both CD and vinyl was that the space of the recording was consistently accomplished in a more lifelike manner with the little MMF-5, if the recording was up to it. The size of the venue comes through quite nicely, though there is occasionally some reduction in soundstage size, most notably the depth. The relationship between resolution and the noise floor is presented amazingly well. Subtleties like the decaying quaver of the struck Glockenspiel from the Respighi Feste Romane [MFHQ 1-507] or the distinct individual sounds of the drumheads from "Nardis" on Patricia Barbers Café Blue are wonderfully exciting. Though far from perfect (and who would expect such at this price? ), the MMF-5 does possess an uncanny ability to get into and reveal the music. Looking at its price point and glass platter, it is almost inevitable that the MMF-5 would be compared to the Rega Planar 2. Though there are some obvious similarities, there are some stronger differences. In favor of the Planar 2 is the Rega RB250 tonearm (selling for $325 separately), which represents most of the P2s retail price. A successful one-piece design, the RB250 'arm is tapered to help cancel inner-tonearm resonance. In the forfeit column, however, you are afforded only a one-piece plinth, no 'arm adjustability, no cartridge or integral record clamp. These are tough sacrifices for vinyl lovers on a budget. Both turntables offer a high-torque, AC synchronous motors and have platters made of dense glass topped with a soft felt mat. When it comes to overall performance, to my ears, the sonic nod has to go to the Music Hall MMF-5. With its two-part plinth, clumsy -- albeit workable -- 'arm adjustability, threaded record clamp and the Goldring 1012GX cartridge, it just outperforms the more established, lesser-qualified contenders, even when you add a similar cartridge. You get so much music for the money that it is downright ridiculous. Though the Pro-ject 'arm may ultimately fall short of the RB250 as a standalone product, in this particular application it more than holds its own, perhaps due in part to the more sophisticated base and commensurate isolation. The total system synergy that you get with the MMF-5 translates into heightened low-bass performance, increased dynamics, greater resolution and remarkably enhanced low-level detail. While I am a big fan of the Rega products, I find the Planar 2 and 3 to be somewhat reticent in those particular areas. The MMF-5 is a highly involving, remarkably musical little turntable. It is common for me to try to improve upon the performance of budget gear with my "Synergizing" approach. Even though I contemplated trying things like using a comparably priced (or better) moving-coil cartridge, adding some type of 'arm wrap, replacing the captive signal and power cords, using a contact enhancer on the cartridge connections, or employing some type of isolation platform (its an illness, what can I say? ), I honestly felt no desire to do them. For getting at the musical goods, the MMF-5 is completely untouched and a true triumph in its class. The Music Hall MMF-5 offers fine levels of detail and quietness. It has warm, deep, slightly woolly bass, remarkably honest midrange and fast, articulate treble performance that errs, ever so slightly, to the brighter side of natural. But at a retail price of $499, it doesnt take a rocket scientist to conclude that the MMF-5 represents one hell of a value. Thought the MMF-2 was and is a good-sounding "budget" turntable, the MMF-5 is a downright steal and allows you to forget you are playing in the minors. You owe it to yourself to go the extra $200 -- the improvement in performance over the MMF-2 is impossible not to justify.